An easy and secure way to make a donation is through the Just Giving scheme. It’s as simple as clicking the donate now button below! Send a cheque or postal order made out to ‘Helping Hand’ and post to Helping Hand, Royal Belfast Hospital for Sick Children, 180 Falls Rd, Belfast, BT12 6BE. Donating to Helping Hand can be as simple as sending a text message on your mobile. To donate £3 text HAND05 to 70070 Text Costs £3.00 plus network charge. Helping Hand receives at least £3.00 Obtain bill payers permission. Please remember to Gift Aid your donation. If you are a UK taxpayer this can increase your donation by 28% with no extra cost to you! To make a Gift Aid Declaration download and complete this form. 2. Organise a fundraising event in your area. Not only are fundraising events a great way to raise lots of money, the can be a lot of fun too – the possibilities are endless! Looking to set up your own online fundraising page? Click here for an A-Z list of fundraising ideas! Get in touch for more information on how to set up your own fundraising page! This is a great way to share your personal fundraising adventures all your family and friends linking in with email, facebook and twitter too! Make your wedding day extra special by supporting Helping Hand and helping to raise awareness of our work with the Royal Belfast Hospital for Sick Children. 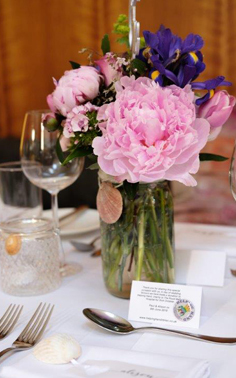 We can make wedding favours for all your guests! Get in touch for more information! 3. Encourage your company or organisation to support Helping Hand. Why not encourage your employer to make us your charity of the year, or make a donation. If you are an employer you could encourage your staff to organise in house fundraising events. In the past this has proven to be great for staff motivation!!! Below are a few helpful downloads to help you find out more about the Helping Hand charity and how you can help out! We’d love your help, unfortunately we cant facilitate any volunteers within the hospital but would greatly appreciate any help bag packing or marshalling at events. If interested please fill out the form below and someone will be in touch!